Spark44, the dedicated agency for Jaguar Land Rover, wanted to document the innovative spirit of the people who have made possible the success of their unique business partnership. In the face of rapid growth (the agency quadrupled in size between 2015 and 2018), Ralf Specht, CEO, wanted to create something that would capture and continue the convention defying vision that makes amazing things happen in the many Spark44 workplaces around the world. 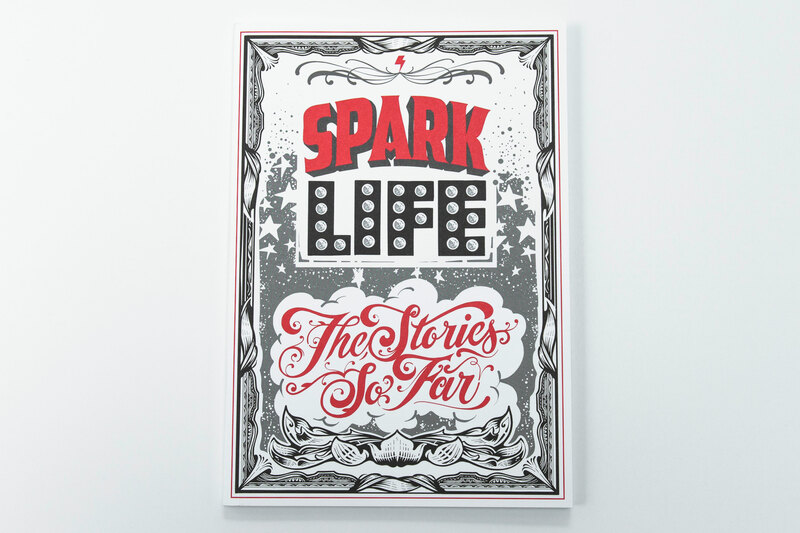 His agency thus commissioned Loveurope and Partners to create Spark Life, a special edition booklet which feels like an inspirational love letter written by Spark44 for Spark44. We commissioned illustrator Vic Lee and provided artist management to facilitate the design, layout and illustration of Spark Life. 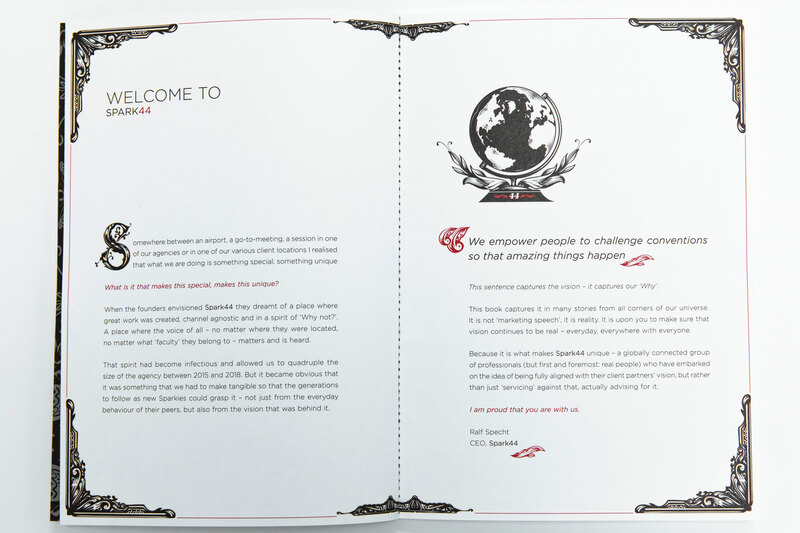 Our print and promotions team handled the litho printing and binding of the special edition booklet. Team members, managers and entire offices contributed their stories of how the Spark44 ethos encouraged them to find new ways of thinking and working which helped them overcome a range of challenges. The testimonials were grouped into thematic sections and woven together by the illustration and artistry of Vic Lee. Well known for his murals and intricate illustrations, Vic’s pen-and-ink style evokes Victorian woodcut prints and classic tattoos. The style is particularly effective with Spark44’s brand colours of black and white with red accents. 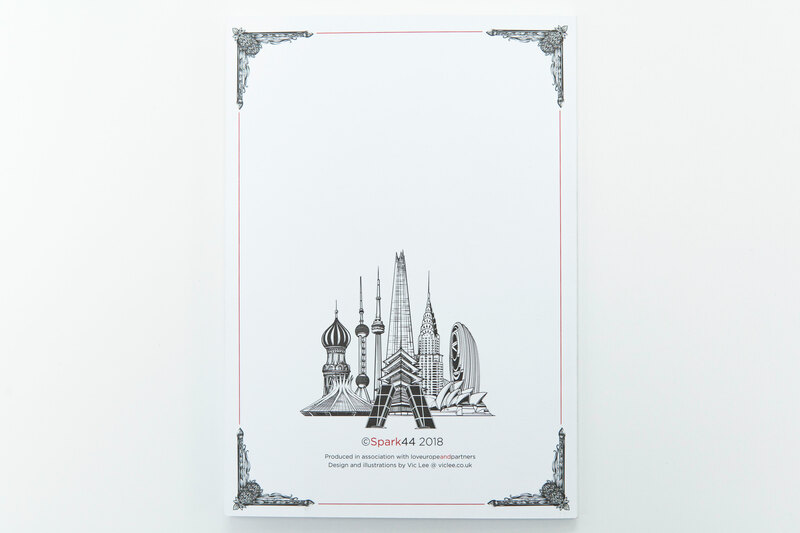 Upon completion, we took care of the delivery of two thousand special edition booklets for distribution amongst Spark44 staff in each of the nineteen offices which criss-cross the globe from Sydney to São Paulo, Toronto to Taipei, and Madrid to Mumbai.